Article looking at research on Palestine Communist Party, looking at, amongst other things, its formation largely by European Jews in the early 1920s and its gradual 'Arabisation'. For any study of the relationship between nationalsim and socialism in the Middle East, the rise and fate of the Palestine Communist Party (PCP) is a focus of interest. If we consider the general and regional levels, there are several reasons for such an interest. Between the two world wars, the PCP was the most important CP in the Middle East. Its endeavour can be understood as an encounter of modern socialism in its leninist form, coming from Europe, with the realities of the Orient. In the. Palestinian case, these two sides were personified in the Jewish militants of the party who had come from Eastern Europe - originally for zionist motives - and in the masses of Arab peasants living in the country. This accounts for the PCP being a case in point not only for the Middle East - where a predominant role of minorities in the communist movement is a common feature - but also for the problem of how socialists tackle national issues in general. Furthermore, and more specifically, PCP history is of utmost importance for any study, of the Palestine problem and its historical roots. For a long time during the mandate, the PCP was the only force in Palestine that did not only fight zionism but also saw clearly the latter's symbiosis with imperialism and accordingly tried to combine anti-zionist struggle with a consistent fight against British imperialism and its accomplices among the Arab leadership. Furthermore, it was the only party that had Jews and Arabs as members with equal rights and proposed an internationalist solution to the Palestine problem. Yet the PCP could not, for all its great efforts, preserve its internationalist outlook and organisational unity up to the end of the mandate. In view of its sometimes heroical efforts to avoid this retreat from internationalsim, this failure shows the force of national dynamics in Palestine as well as an inherent weakness of the communists' own attitude towards national problems. An account of the PCP's search for an internationalist solution of the Palestine problem and of the failure of this search may afford a deep insight into the history of this issue and especially into its social aspects. Yet, in spite of its importance, the history of the PCP has not untill recently aroused any marked interest. This may be due, among other factors, to the inaccessibility of the sources and to the insufficiency of the older works dealing with the subject. In the West, the works of W. Laqueur were almost the only ones containing information on the PCP. Laqueur relies on a relatively good knowledge of the original sources, but what he makes of them is seriously influenced by his zionist and anti-communist outlook and his consequent desire to slander and ridicule the PCP. Despite this fact, Laqueur's works are still widely used by all writers on the subject, sometimes with a critical remark but seldom in the necessary critical spirit. The Arab public had until recently to rely on works by I. Murqus, H. Darwaza and A. Yasin. Their factual information is not better than that of Laqueur (from whom they derive much material, by the way); and they inevitably point to the fact that most of the Palestinian communists were Jews and that for this reason they were - in their opinion - unable to serve the interests of the Arab population. By accepting this Arab nationalist point of view, the authors in question subscribe at the same time to a fundamental zionist principle, namely, that zionism and Jewry, in the last resort, are but one. 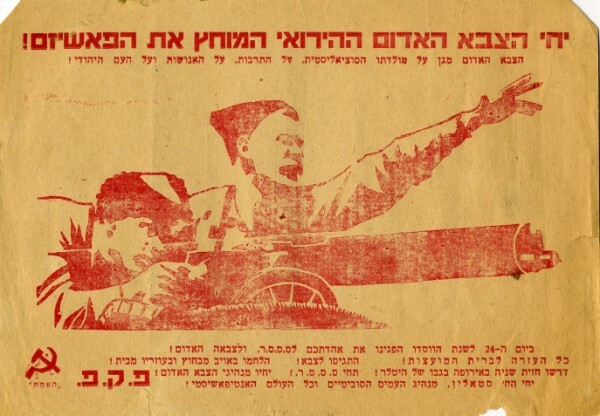 In Israel, publications on the PCP were limited to some anticommunist works in the spirit of Laqueur and to some reproductions of original documents. The Israeli CP, successor of the PCP, did very little to make known its own early history. Only the very last few years have brought a change in the interest in PCP history. Without analysing the reasons for this change, which must be sought in the increased interest in the Palestine problem as a whole, we can only welcome it. In this review we shall outline the character, the scope, and the sources of the major studies on the subject that have appeared so far. Mario Offenberg, Kommunismus in Palaestina. Nation und Kalasse in der antikolonialen Revolution, Meisenheim am Glan 1975 (Ph. D. thesis, West Berlin, 1975). This work deals with the social and political conditions of the communist enterprise in Palestine, with the pre-history of the party, ie, its roots in the Eastern European Jewish workers' movement, and with its early history up to about 1925. For the first time, we now possess a reliable account of the background and the early history of the party, for this early period was particularly little known. Yet it is very important because at that time the PCP (formed as MPS in 1919) underwent the critical development from left-wing zionism to anti-zionist internationalism. Offenberg starts with a chapter on Palestinian social structure emphasising its difference from the Eurpoean model. This chapter, going far back into history, is perhaps insufficently linked to the general subject of the study. The second chapter deals with the interests of British imperialism in Palestine and its ensuing policy, the third treats the unsuccessful attempts to bring about a working alliance between the left-zionist Poalei Zion World Union and the Comintern. The World Union rejected the demand of the Comintern to free itself definitely from zionism, so the merger did not take place (1922). The remaining chapters deal with the roots, emergence, and early history of the party in Palestine. It developed out of the Palestinian Poalei Zion party. The latter split in March 1919, and its left wing founded MPS in October of that same year. This party then became MPSI, JCPPZ, split up into PCP and CPP in September 1922, and re-united as PCP in July 1923, when it became an openly communist party with a clear anit-zionist program. This party performed its mass activities mainly through the 'workers' fraction', its trade union organisation which was expelled from the Histadruth in April 1924. In his account of party history, Offenberg draws heavily on a wide sample of original party material and on interviews with numerous old party members. The use he makes of his sources is, however, not uncritical: For all important issues, party statements are confronted with contemporary realities. The study treats a variety of issues related to PCP history, but (quite naturally in the case of this party, and especially for its early period) it centres on the CP's stand towards zionism. The treatment of the party's history as a whole ends with the Afuleh events (November 1924) and their aftermath, but for its relationship with the Arab national and workers' movements the account is continued till 1929. Upholding a clear distinction between developments on the Palestinian and on the international level, Offenberg concentrates on the former, unlike other works that confound both or see the PCP only in terms of global COllÙntern policies. In another sense, too, he sees the party's history from 'within'; starting from a socialist, internationalist point of view, he tries to uncover the tradition of this attitude in Palestine. Therefore he stresses the early period during which the party gradually gained its internationalist stand. He shows how this development proved the incompatibility of zionism and socialism. Unlike the authors we have mentioned, he strongly argues that zionism and Jewry are noLthe same and that the PCP was right in distinguishing between them. From this angle, he criticises the Arab leadership in Palestine that took the opposite view, and shows how this and other reactionary characteristics of the Arab national movement precluded a durable co-operation between it and the PCP. Offenberg's study points to the lessons to be drawn from early PCP history for the search for a just solution to the Palestine conflict still enduring today: There were very early proposals to solve the problem on an internationalist basis; the attempts to follow these lines met with great difficulties; but there is no other way to reach a durable solution to the conflict. Beside this view and the materialist method, the book is unique in its exhastive use of original sources. Therefore, one would hope to see it continued beyond 1925. Jacob Hen-Tov. 'Communism and Zionism in Palestine. The Comintern and the Political Unrest in the 1920s, Cambridge, Mass, 1974.
without inquiring into the real nature of this imbalance and its material effects on the Arabs. Hen-Tov's outlook resembles that of Laqueur, but there is an important difference: As a sophisticated zionist, Laqueur quite skilfully uses true and half-true statements to distort the truth, renders his sources inaccurately, and tries to present his own opinion as gospel truth. Hen-Tov, as a somewhat naive zionist, often uses zionist sources quite uncritically, but they are easily discernible as such. As a scrupulous researcher, he renders his quotations exactly and always specifies his sources. Therefore, his chapters VI, VII, and VIII, describing the ideological struggle of communism against zionism, the PCP reaction to the August 1929 events, and the subsequent reassessment of party policy, do not intentionally distort communist argumentation. Where an analysis would have been necessary to grasp the meaning of a certain view or theory, Hen-Tov's assessments sometimes remain superficial. Such is the case with the Yishuvism doctrine, where he overrates the implicit zionism of the doctrine, thus accepting Lists's opinion too uncritically. 'The struggle against Ziònism . . . was to become a security matter of a very high priority.' (p68, see also p84). While this argument may have played a role in Soviet politics, it did not influence the Palestinian communists in their enmity towards zionism to any noticeable extent. When, in their crusade against the danger of war, the communists charged the zionists with emoling themselves in the coming attack on the SU, this was meant for the Middle East and had nothing to do with Soviet Jewry. For Hen-Tov, however, it hardly matters whether an action or a view was taken by the Soviet government, by the Comintern, or by a single CP: They are all seen as integral parts of one homogeneous movement. This over-simplistic view precludes an adequate understanding of the actual relationship between these different bodies. Indeed there was a considerable dependence of CPS on the Comintern and, for that matter, on Soviet foreign policy. But this did not mean that they were completely independent of domestic realities. Disregarding the latter leads to an incomplete and in some regards false picture of the party concerned. Yet in spite of its idealistic, Soviet-centred approach and its pro-zionist outlook, Hen-Tov's book is a useful and reliable source of factual information if one takes into consideration its character. Suliman Bashear, The Arab East in Communist Theory and Political Practice, 1918-1929. Unpublished PH D. thesis, Birkbeck College, University of London. May 1976. An Arabic version was published in Jursualem in 1977. This work deals not only with PCP history but with the emergence of the com11i.unist movement in the whole Eastern Arab region. In part I of his study, Bashear describes the general setting: the situation of the Arab East after the first world war and the Comintern's attitude towards colonial problems. Part II is an account of communist practice in the Arab East during the period concerned; ie, mainly the emergence and early history of the Egyptian and Palestinian CPs, with a chapter on the latter's participation in the creation of the Lebanese-Syrian CP. For each of the first two parties, there are three further sections: historical background and foundation, activity, and repression. As for the PCP, Bashear emphasises its origins in left-wing zionism and points out the grave problems resulting from this fact for its work among Arabs even after the party's 'march off zionism'. Its activity during 1920's was in three main fields: work against zionism among the Jews, striking roots in the Arab population, and regional responsibility for other Eastern Arab communists. Repression was a constant feature of party life from 1921 on. Bashear's sources are mainly the Comintern periodicals and reports mentioned above and numerous reports and files in British government archives, of which he makes extensive use. Thus he is able to provide a good account of the actual communist practice on the spot. The original PCP material he uses is relatively scanty. On the other hand he cities quite a number of books on the social background of CP activity: the different Arab countries after the war and their respective national movements. So he can confront communist projects and statements contained in the Comintern press with the social reality to which they were supposed to correspond, as well as with the practical outcome of their efforts as judged by police reports. This facilitates a critical Use of the communist sources and a critical assessment of the communist endeavour as a whole. Part III of the thesis, communist political theory, deals with the communists' comments on and explanation of some important questions concerning national liberation in the Arab East: the relationship between national and social features of the anti-imperialist struggle (the example of Egypt), zionism and imperialism (Palestine), the armed uprising in Syria, Iraq and the Arabian Peninsula, and Arab unity. Part IV continues the account of the Comintern's attitude towards the Arab East, begun in part one, from 1921 to 1928. In reality it amounts to a study of the Comintern's colonial policy in this period. In his conclusion Bashear draws a picture of the role of the Arab East in the Comintern's colonial policy, which was rather limited; of the weight the communists actually had in the Arab East - quite minimal; and of the consequences they drew from their situation, in line with the general policy of the Comintern: setting up a united front with the national bourgeoisie against imperialism. They failed to reach their purpose, most spectacularly so in Egypt. In 1928, with the hardline policy of the Comintern's 'third period', there began a new phase for Eastern Arab communism, too. Maher Al-Charif, L'Internationale Communiste et la Palestine 1919/1939. These de doctorat de 3eme cycle. University of Paris I (Sorbonne),1977. This study has for its subject the relationship between the Communist International and Palestine from 1919 to 1939, ie, from the founding of MPS to the outbreak of the second world war. Its purpose is to examine whether and how the Comintern acquired a correct view on the Palestinian problem, and whether the instructions ensuing from this view were right. In the first part of his thesis, Charif discusses the general line of Comintern policy for the colonial world and its stand towards Arab countries, and draws a picture of conditions in Palestine after the first world war. The second part tells the story of the roots of Palestinian communism in the Jewish workers' movement in Eastern Europe and its development up to the admission of the PCP to the Comintern. The third part treats the attempts of the PCP to meet the demands of the CotTIintern concerning Arabisation and regional responsibility. The fourth part deals with the sixth Comintern congress, the August 1929 events, and the subsequent changes of party policy. The fifth part deals with the seventh CI congress and the PCP's involvement in the Arab rebellion in Palestine from 1936 to 1939. Charifs sources are, for the early period, mainly Offenberg's book which he cites very extensively; for the later period his interviews with Mahmud al-Atrash, a former leading Arab member of PCP; and for the whole period Comintern material, especially Inprecorr, The Communist International, and the RILU journal. As its title announces, Charifs study focuses on the Comintern's attitude and relationship to Palestine as reflected in congress discussions, in resolutions, and above all in articles on Palestine for the central press of the Comintern. The interviews with Atrash - who was a member of the ECCI from 1935 to 1943 - complete the picture. The wide use of Offenberg's study, however, renders it rather unbalanced, because it allows Charif to go far more into detail and to concentrate more on the Palestinian level than is possible for him regarding the remaining period. The first question Charif wants to examine in his study - whether the Comintern developed a correct stand on the Palestine problem - he answers in the affirmative, and convincingly so. As for the second question - whether the Comintern gave the right instructions to the PCP - he also affirms this; he even says that the Comintern's stand was more valid than that developed by the Palestinian communists themselves. His argument on this point, however, is not convincing. A satisfactory answer to this question would require an analysis not only of the Comintern attitude and its instructions - as provided by Charif - but also of social and political conditions in Palestine in relation to the party's efforts. This latter analysis is lacking. Only by virtue of such an analysis, however, would we be able to distinguish the objective reasons for the PCP's failure from the subjective ones, and then judge the validity of its programmes and instructions. The instructions and demands of a distant centre often tend to look more correct than the results of party work that faces difficult circumstances; but this does not say anything on the validity of the stands taken. On the contrary, a certain scepticism of the people on the spot, who know the difficulties, may be more justified than an obligatory revolutionary optimism. Another feature of Charifs study is its sometimes uncritical use of communist sources (as admitted by himself, see p15 of the thesis). In our opinion, this stems also from the relative neglect of the social conditions in Palestine, which is justifiable for a study that deals with Comintern politics only but which does not allow a critical assessment of PCP activities. Charifs thesis gives an account of the relationship between the Comintern and Palestine. It fails, however, to investigate the social background of PCP activity which would have been necessary to answer his second question. In our opinion, a satisfactory and well-founded answer on this question will only be possible after considerable further research. Musa Budeiri, The Palestine Communist Party, its Arabisation and the Arab Jewish Conflict in Palestine, 1929-1948. Ph. D. thesis, London School of Economics, 1977. The main interest of Budeiri's thesis is the attitude of the Palestinian communists towards the Arab population and their activity in this direction. After an introductory chapter on the rise of the PCP and its development up to 1929 (when the necessity of Arabisation came to be particularly felt), Budeiri traces the activity of the party from then on, with special emphasis on Arabisation and work among Arabs (after 1943, there are of course several organisations to be dealt with). He marshals a wide range of source material (party documents, journals, memoirs, intelligence reports etc) in addition to his interviews with numerous old party members or fellow travellers, mostly Arabs. Starting from this material, he presents a very instructive account of the party's history for a period that has not hitherto been seriously studied. Both points are disregarded by most Arab authors writing on PCP history: they do not perceive the close connexion between the failure of the PCP and the failure of the Arab national movement to prevent the creation of a zionist state in Palestine, nor do they see the party and its fate in the context of the political and social conditions of the country. In relation to those writings, Budeiri's thesis is an exception. True, it does not carry the analysis of social realities in Palestine to a point where a comprehensive critical assessment of PCP policy would be possible. On the other hand it discusses quite extensively the influence of the Arab-zionist conflict on the party's fate. 3 the period from 1943 to 1947, when there existed separate communist organisations in the Jewish and Arab sectors, which worked freely amongst the respective populations (p303f of the thesis). In the first period, Budeiri states that the communists laid the emphasis of their activity on the social struggle and neglected the national one. In the second phase, starting with the August 1929 disturbances and the prescriptions of the Comintern, the communists tried to step up the Arabisation of the party and gradually gave their policy a clear Arab national orientation. Therefore they had to abandon their previous internationalist stand. This is assessed by Budeiri as positive or inevitable (p66f). Yet he criticises the party for the remains of socialism and internationalism in its ideology that led it to take a hostile attitude towards the Arab national leadership and thus 'did slow down the process of Arabisation and the desired penetration of the Arab population' (pl03). As he maintains that the communists' 'call for joint activity in pursuit of supposed common interests' was meaningless (p66), 'Budeiri cannot but welcome the eventual ethnic split in 1943, which gave the Jewish and Arab communists the opportunity to work in their respective sectors unhampered by internationalist considerations. In doing this, the communists gave way to 'two opposing tendencies: support for the aims of the Arab national independence movement, and the crystalisation of the belief that the Jewish community in Palestine was undergoing a process of transformation into a national entity' (p305). Budeiri makes it quite clear that he sees the split as a result of the development of the Palestinian reality, the building up of a Jewish community dominated by zionism, the widening gap between the two communities, and the ensuing pressure on the communists to withdraw from an internationalist venture. He apparently approves of this development: it was the logical outcome of the changing realities and of the choice of the Palestinian communists (made at the beginning of their 'second period', about 1930) to put national considerations above social ones and to take the path of Arab nationalism. Once separated from the Jewish communists, the Arab communists could take this direction much more easily and with a certain measure of success. Here Budeiri, in our opinion, overrates the positive consequences of the split on the work among Arabs, the success of which had also other reasons. Since the 'nationalist' turn of the previously internationalist PCP allowed successful communist work among Arabs, Budeiri seems to be prepared to make allowances for the 'parallel' move of the Jewish communists closer to zionism (they wholeheartedly welcomed and supported the creation of the State of Israel). Support for partition was, in this situation, not a sudden change of position but the logical outcome of a previous choice. It did not 'imply a change in the international communist movement's longterm strategy of supporting the Arab national independence movement' (p306). For Budeiri, the successes of this strategy would have been impossible without the Arab nationalist direction taken by the PCP since 1929. On the other hand, he justifies the internationalist line of certain periods of the PCP, since without this rigid internationalism and insistence on the social revolution the Jewish communists would not have been able to recruit Arab members and thus to create the germ of an Arab communist movement (p38f, 305). The general tendency of the thesis is an acceptance and justification of the national course taken by the Palestinian communists, Arabs and Jews alike. This is a stand more sincere than that of the Israeli CP, which in most cases simply denies any deviation from internationalism in the history of Palestinian communism. On the other hand, this treatment can be understood as an implicit justification of the Israeli CP's actual policy that aims at a conciliation or coexistence of conflicting nationalisms more than at a solution based on a fundamental internationalism. The development traced by Budeiri may indeed have been inevitable under the given circumstances. It is probably also true that by retaining an internationalist and socialist outlook for a certain time and to a certain degree, the PCP slowed down its change into a radical Arab party. Yet from the point of view of social progress and a real solution of the Palestine problem it might have been more important to cling to an internationalist outlook - even without immediate practical results - than to create one more radical Arab party. One may also ask whether support for Arab national aspirations really made it necessary to subscribe entirely to Arab nationalism and to consider the whole Jewish community as a lost cause. Budeiri's undertaking to discuss his subject from the aspect of the rise of an Arab national communist movement - which he does on an imcomparably higher level than, eg, 'Allush and Farhan - is perfectly legitimate, but we don't deem it sufficient. From our point of view, influenced by the wish to seek an internationalist solution to the problems of today, we would like to investigate more deeply the fate of the internationalist and revolutionary socialist stand taken by the PCP not only from the aspect of the national struggle in Palestine but also by taking into consideration the social realities of this country. In my own (German) Ph. D. thesis, Nationalism and socialism in the Arab East; The relationship between the communist party and the Arab national movement in Palestine, 1919-1948, I made an attempt in this direction. For a more thorough discussion of all crucial issues of the PCP's undertaking during the mandate, and in spite of the very useful factual information contained in the works we have spoken of, considerable further research is needed. An important step would be the assembling and editing of the mostly Hebrew and Yiddish original party document, so as to facilitate their use by those researchers who do not read these languages or have no access to the Israeli archives. In any case, work on PCP history should go on - preferably in a more cooprative way - for this would greatly enrich the ongoing debate on the character and prospects of the movement for the complete liberation of the Arab East, including its national minorities. Walter Z. Laqueur, Communism and Nationalism in the middle East, 50 Recent studies on the PCP London, Routledge & Kegan Paul 1956. Elias Murqus, History of the Communist Parties in the Arab World (in Arabic), Beirut, Dar al-Tali'a 1964. Al-Hakam Darwaza, Regional Communism and the Arbas' National Struggle (in Arabic), Beirut, Dar al-Munaymina 1963. 'Abdelqader Yasin, 'The PCP and the National Question' (article series, in Arabic). In: Al-Katib (Cairo) no 120 (March 1971), p88-100; no 121 (April 1971),p100-177;no 123 (June 1971),p143-l55. Mario Offenberg, Kommunismus in Palaestina. Nation und Klasse in der antikolonialen Revolution, Mesisenheim am Glan 1975. Jacob Hen-Tov, Communism and Zionism in Palestine. The Comintern and the Political Unrest in the 1920's, Cambridge, Mass. Schenkman 1974. Suliman Bashear, The Arab East in Communist Theory and Political Practice, 1918-1928, Birkbeck College, University of London, May 1976 (forthcoming from Ithaca Press). Maher al-Charif, L'Internationale Communiste et la Palestine 1919/1939, University of Paris I (Sorbonne) , 1977. Musa K. Budeiri, The Palestine Communist Party, Its Arabisation and the Arab Jewish Conflict in Palestine, 1929-1948, London School of Economics, 1977 (forthcoming from Ithaca Press). Naji 'Allush The Palestinian National Movement Versus Jews and Zionism 1882-1948 (in Arabic), Beirut. PLO Research Center 1974. Ahmed Farhan, 'The PCP was the Victim of the Twin Nationalist Extremisms' (in Arabic). In: Al-Katib al-Filastini (Beirut), no. 6 (Dec. 1978), p12-40. Emil Habibi, 'Was the PCP the Victim of the Twin Nationalist Extremism?' (in Arabic). In: Al-Jadid (Haifa), no. 3 (March 1979), p5f,4649. Alexander Flores, Nationalismus und Sozialismus im arabischen Osten; Das Verhaeltnis der kommunistischen Partei zur arabischen Nationalbewegung in Palaestina, 1919-1948, University of Muenster, 1979. Alain Greilsammer, Les communistes israeliens, Paris, Foundation nationale des sciences politiques 1978. 2. E. Habibi (see list below), both quotations on p48.